I have to say it’s been a bit hard to knit or crochet today, as it’s been super hot in Melbourne! But I realised that there is a project I have yet to share with you. A little while back, I may have mentioned that my lovely nana sent some yarn in a parcel and I have decided to follow the current fashion and use it to make a lacy kimono. I feel like kimonos have been everywhere this season, and I’m very happy to me making one (which I probably won’t use until autumn, but that’s okay!). Here it is, isn’t the pattern lovely? I’m really looking forward to finishing it, it’s supposed to be knitted in one piece starting from the bottom and I’m almost at the neck, yay! A couple of weeks ago, a saw a really cool post on Kais (Empress Fibres) blog: a tutorial to English paper piecing! I have always been intrigued by this and the tutorial was so well done that I decided to jump right into it! I first wanted to use scallops shapes but I realised that I was way over my head with the curves 😅 Maybe when I get a bit more practice! So I ended up going for a jewel shape, I really like it and it’s only straight lines, so manageable for a total beginner! I decided to print out my own shapes, I printed them on carboardy paper, and they’ve been holding their shape quite well! I used a free template I found on Google with a bunch of shapes, so I’m prepared for the years to come! I just really enjoy it, it’s super relaxing and there are so many possibilities! This is what I’ve got so far. Do you see the hearts? I hope you are having a good week so far, mine has been pretty busy after the break last week. I have been on a sock rampage, I have only started those Mercury socks on Sunday and look how much I’ve done already! I have turned the heel already and have started knitting the foot. I really love how the yarn stripes, the colours are just so cheerful! 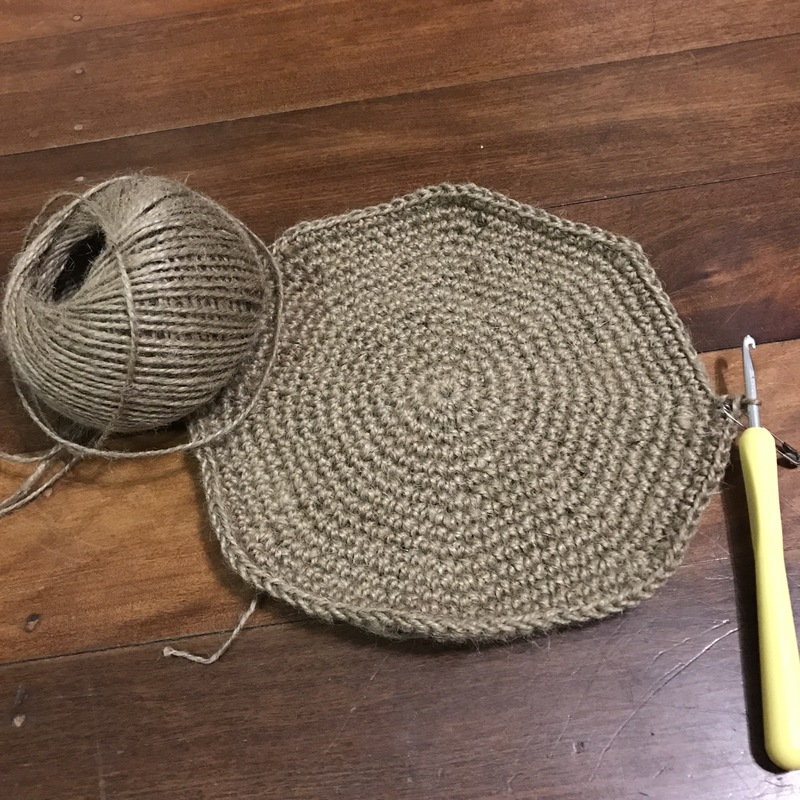 The pattern I’m using is a free pattern on Ravelry from Kim Drotar and I like it a lot, especially how easy it is to remember. I’ve also been loving my new 9 inches (30 cm) circular needles, they are just so good for this type of socks and I feel like they’ve made it much faster. I also have received my yarn order finally! yay! I got 4 colours and the yarn is from Scheepjes (it’s Catona which is mercerised cotton). 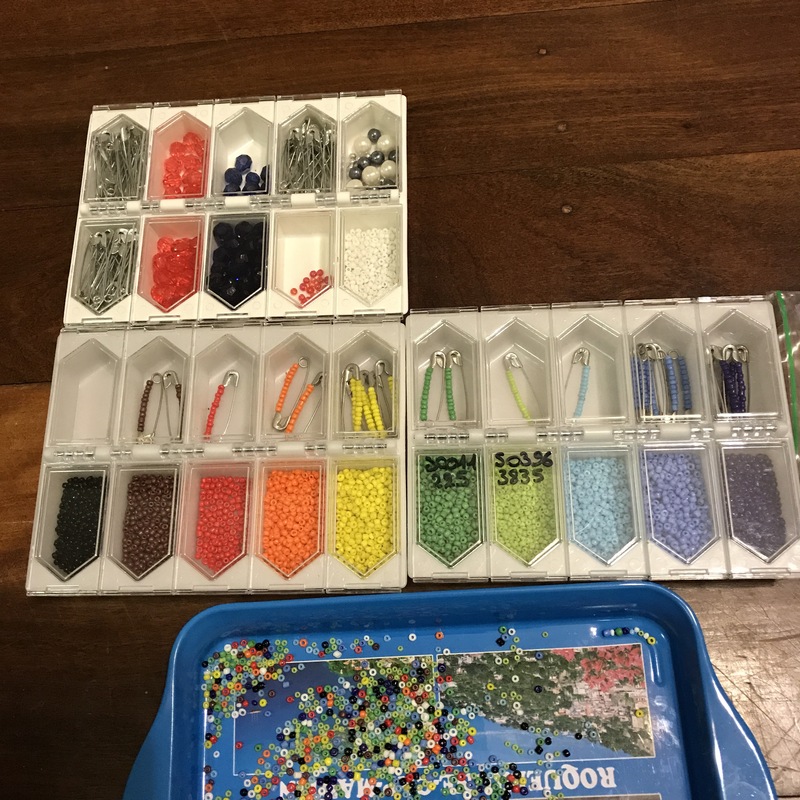 I followed your advice and went to Wool Warehouse, and honestly it was a very good price, especially for shipping all the way to Australia. Aren’t the colours pretty? I’ve already started the first row of the shawl I’m planning to make, I really hope that it works as I see it in my head but only time will tell! I hope you’re all having a great week! I have made more progress this month on my Joyful World from the Snowflower Diaries. 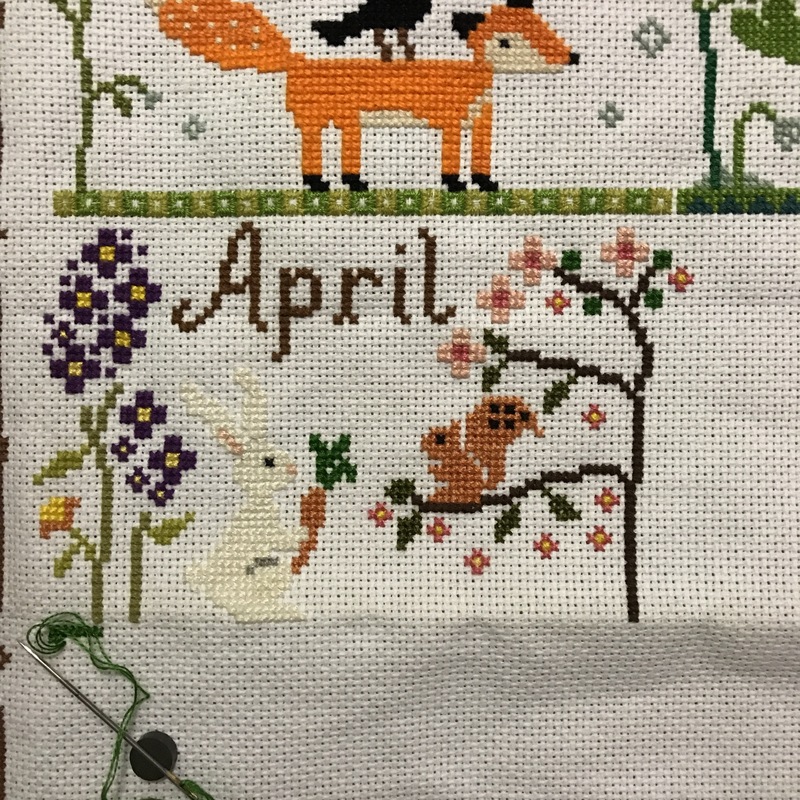 I have pretty much done all the greenery and I need to add the critters for this month, a couple of cats in the middle and a dove on one the branches. My best friend’s birthday is coming up in a few weeks and I really wanted to make him something special. He was a bit depressed because we are leaving the “youth” age group, so I knew I had to make something happy and bright. I’ve settled on a marine themed blanket, so I’m using the ripple stitch to imitate waves and I will have 4 different shades of blue, with smaller amounts for the lighter blue and a lot of the darker blue to imitate the different depth of the sea. I’ve already finished one of my skeins of yarn, the lightest blue, and just started on the second one. I think that I might need to go buy some more at that rate but I’ll see once I’ve finished this second colour. My idea is then to apply appliqué fish, shells and other marine creatures to make an underwater scene. It’s been working up quite fast (I’ve started on Monday) so hopefully I can get the base blanket done, block it (it will need it! ), and still get some time to play around with appliqués! 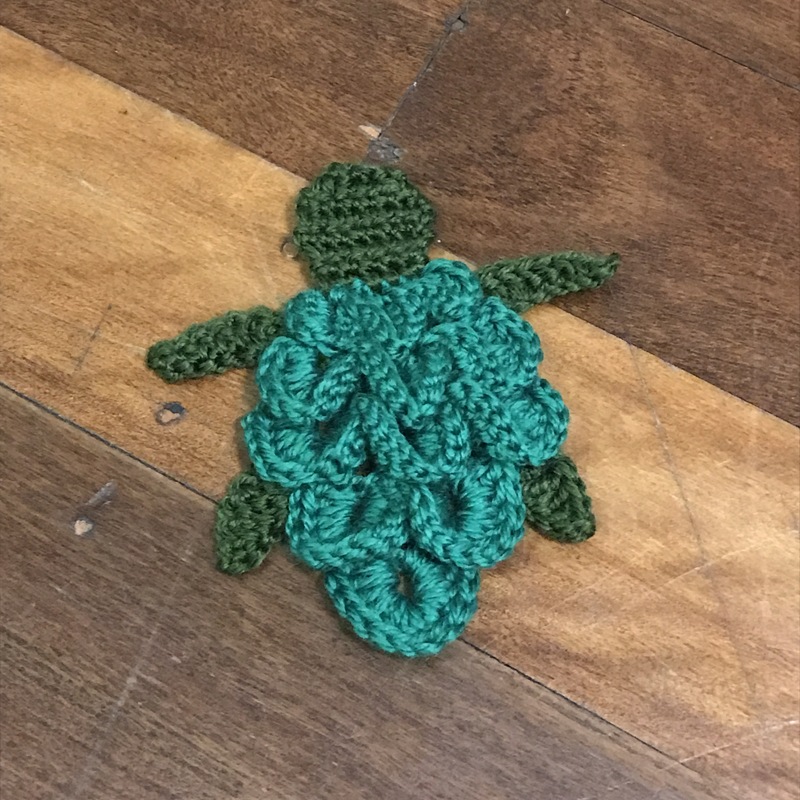 This is what I’ve freehanded so far, I’ve made the shell in crocodile stitch to give some texture. Do you guys have a favourite marine themed appliqué that you think I should really include? And do you have any suggestion on the best way to attach them to the blanket once it’s finished? 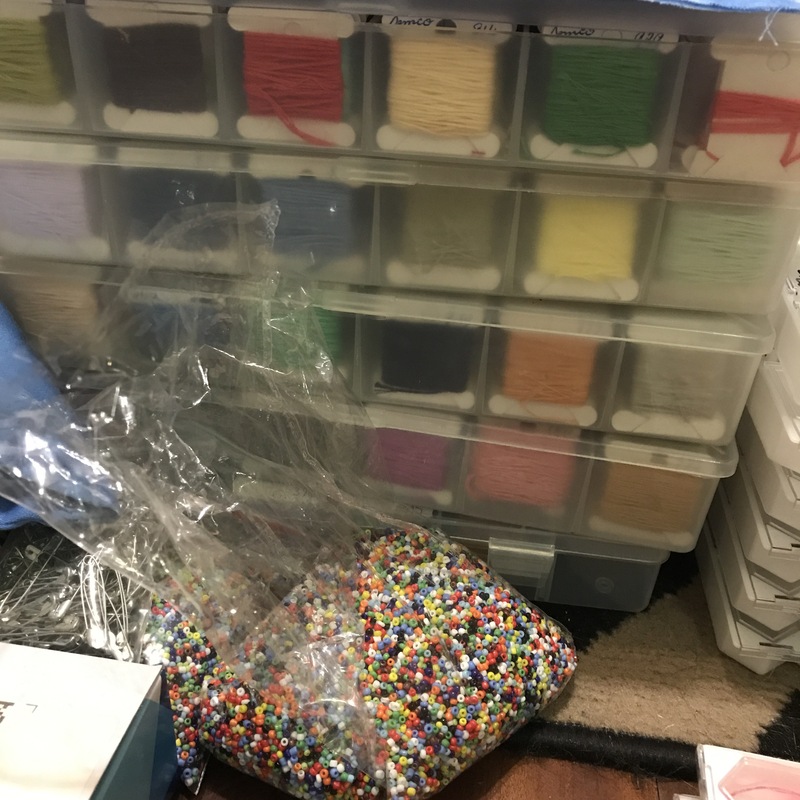 Most of those will go into boxes but I’m keeping enough threads to work on my joyful world SAL from the Snowflower Diaries. This is where it was at last time. 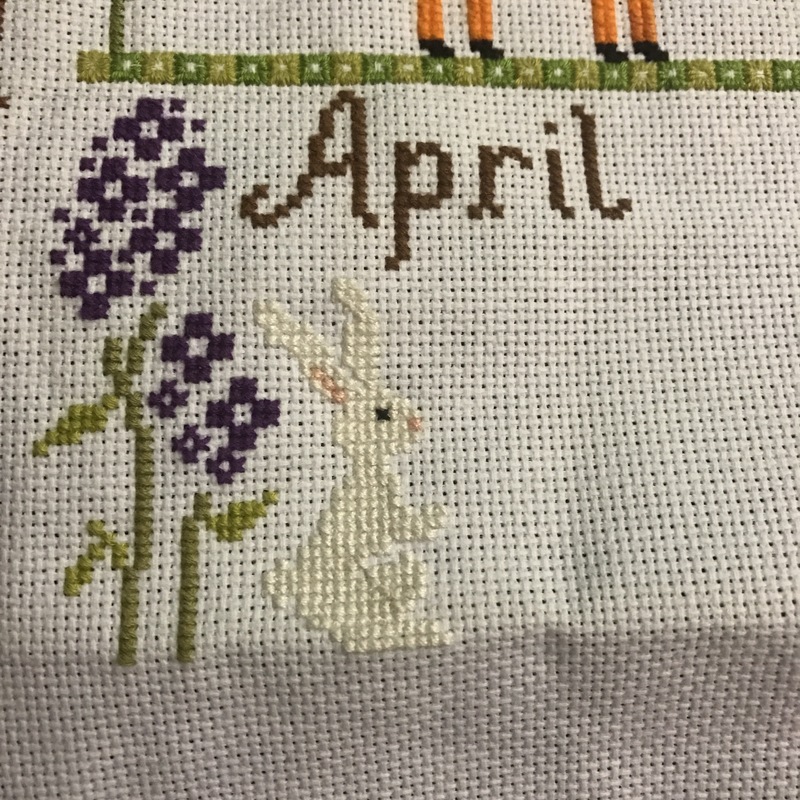 And now I’ve almost finished April, with only the ground to finish stitching. Now, back to packing a few things before bed! The week has already been super busy with starting to tutor again for the semester at university and a big experiment under way, but I’ve managed to get some stitching time. 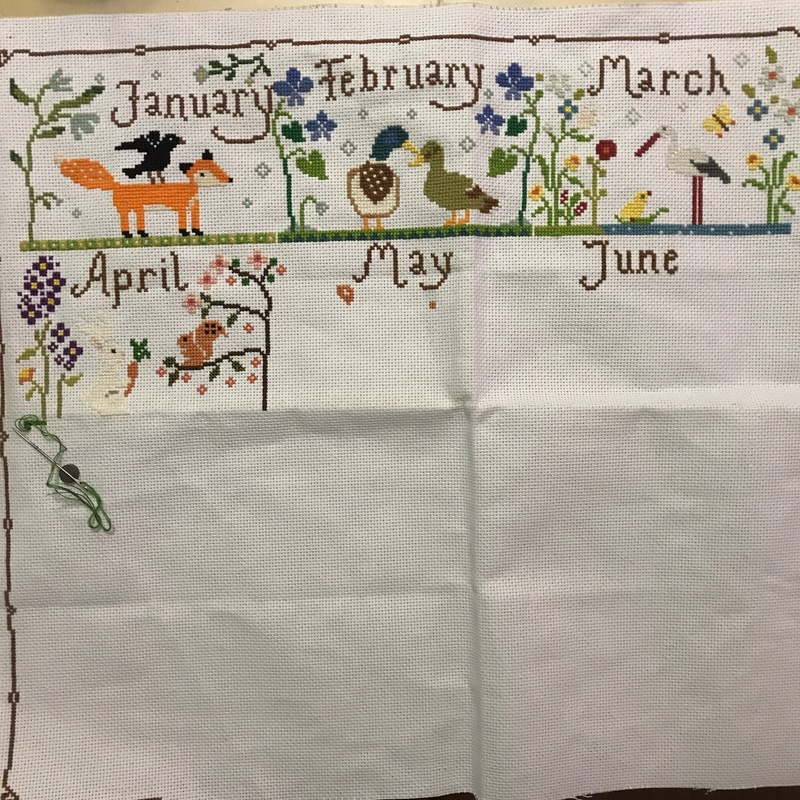 I’ve dug up my joyful world calendar from the Snowflower diaries and started stitching April. Isn’t this bunny the cutest? There is also a cherry tree and a squirrel that will go to the right of this month. Now that I’ve started again on this piece I’m really excited to keep going and finish it, hopefully it won’t take the whole year! I’ve finally started a project that I’ve had pinned for a few years now: a netted linen market bag from PurlSoho. I’m actually making mine using jute rather than linen and a 3.75mm hook, so I’m expecting to do less rows while keeping the same size. I’ve started the bottom of the bag and it has worked up quite fast so far, although the jute isn’t the most pleasant fiber to work with (it’s a bit rough). I’m wondering if a go in the washing machine might soften it a bit. Has anyone tried to wash jute before?